It is easier to visualize their clothing once you understand the unique way Egyptians drew the human form. We will look at the material, the various styles they wore, their makeup and finish with the scented cone. Every artist must follow a particular set of conventions in order to transfer three dimensional reality to a two dimensional painting. To reverse the process and see the reality that inspired a particular painting we must use the same conventions the artist used. Many artists today, for example, want to show what something looks like to a person standing in a particular place. The artist uses relative size and shadow in order to show the required perspective. The Ancient Egyptian was less interested in how something appeared to a particular viewer and more interested in what the object actually looked like. To that end he chose different view points for each part of the body. The face, hip, legs and feet are usually shown in profile while both shoulders face the viewer. Paintings of women often show one breast in profile. It is clearly impossible for anyone to stand this way, but it was believed that this was the best method for solving the problems that arise in going from three dimensions to two. Most of the clothing in Ancient Egypt was made of linen; a few items were made from wool. Cotton was not introduced until the Coptic (Christian) period. Linen is spun from the stem of the flax plant. Different grades were produced depending on the desired end product. The finest thread was produced from the youngest plant. Spinning, weaving, and the sewing of clothes was an important activity at all levels of society. Royal harem ladies were involved in it as a commercial enterprise, and peasant and workers' wives produced clothing for their families and bartered the surplus. Various plant dyes were sometimes applied before weaving to produce red, yellow or blue thread, but most was left in its natural color. After the weaving was done, linen could be sun bleached to produce an attractive white cloth that was very popular with the well to do. Unlike the modern western world, women's clothing in Ancient Egypt tended to be more conservative than that of men. Throughout the Old, Middle and New Kingdom, the most frequently used costume for women was the simple sheath dress. A rectangular piece of cloth was folded once and sewn down the edge to make a tube. The dress would extend from a few inches above the ankles to either just above or just below the breasts. Two shoulder straps held the dress up. Some people believe the evidence should be accepted at face value and assert that the dress was worn with the breasts exposed. Others argue that the narrow strap was an artistic convention only and that in real life the shoulder straps were wide enough to cover the breasts. All of the figurines and the few surviving dresses support the latter view. It should be noted that the Ancient Egyptians would certainly not have regarded a bare breast as immodest. In the New Kingdom many men and women adopted a robe which could be draped in various ways. Two rectangular pieces of cloth, each about four feet by five feet and sewn together along along the narrow end, leaving a space for the neck. The basic outfit was easy to make and could be worn by a man or a woman depending on what was done next. Once the dress was on her, a woman would lift the two bottom corners, bring them around to the front and knot them under the breasts. The robe was often worn with vertical pleats. The shawl, or sari, was very popular among upper class women in the New Kingdom. It consisted of a piece of cloth approximately 4 feet wide by 13 or 14 feet long. One corner was tied to a cord around her waist on the left side. Pass the material lengthwise around the back, gather up some pleats and tuck them into the cord at the front, and pass the remainder around the back and front again, passing it under the left armpit, around the back again, over the right shoulder and toss what remains back over the left shoulder, bringing it around and tie it to the end originally caught in the belt. The shawl was often made of pleated material. Common accessories, as illustrated at left, included a pleated cape and a long colored sash that was knotted around the waist and allowed to hang almost to the floor at the front. The most important of all the fashion accessories was the wig. Shiny, black hair, perhaps because of its association with youth and vitality, was associated with eroticism, and artificial hair was a simple way to maintain what nature neglected. Wigs served a more practical function, however. Natural hair that was thick enough to protect the wearer from the direct rays of the sun on a bright summer day or keep the heat in on a cold winter night, was much too hot to wear indoors, and a luxuriant hair-do was a breeding ground for lice. The compromise was simple: Egyptians who could afford it cut their hair short and then wore a wig. Unlike many toupee wearers of today, the Egyptians were quite proud of their wigs and made no attempt to pretend they were natural. Paintings and sculpture frequently show an area of natural hair between the forehead and the wig. While the most expensive wigs were made with real, human hair, the design and structure were such that it would be almost impossible to confuse a wig with the real thing. Egyptians were proud of their wigs and would have been distressed at the thought that someone might think they were not wearing one---or even worse, could not afford one. Palm fiber was used to make a skull cap to fit the subject’s head. Human hair, alone or mixed with plant fiber and wool, was twisted, curled, or pleated into slender braids and attached to the cap with beeswax or resin. Various dyes were used to produce the desired black. The basic structure remained the same throughout Egyptian history, but many variations were possible, and the style varied over time with the age, gender, and social class of the wearer. Old Kingdom women wore wigs with two or three lairs of very tight braids across the top of the head and down both sides and the back. There may or may not have been a part in the middle. Several additional layers were added underneath to make the sides so much fuller. 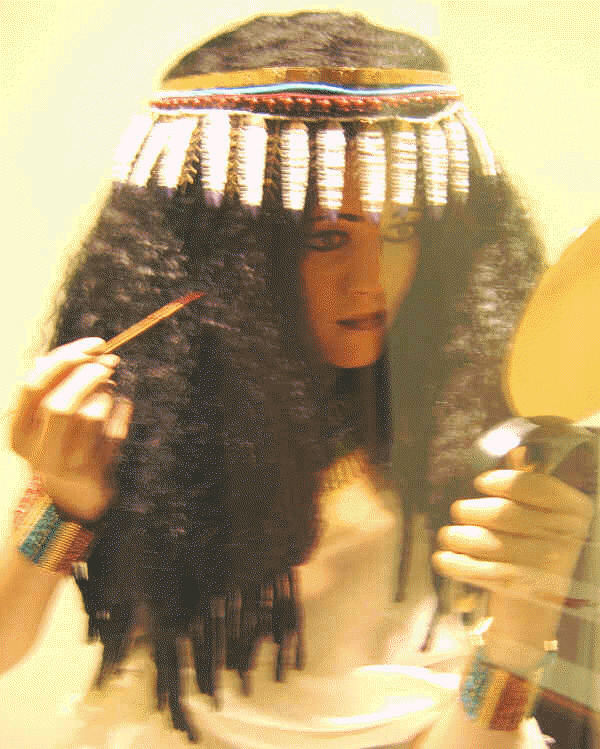 In addition to having or not having a part in the middle, Old Kingdom wigs varied in length. Simpler style stopped anywhere between the top of the shoulders and just below the ears, a fuller version of what today might be called a bob. There were two very popular styles with hair going down to the breasts. The tripartite wig, as the name suggested, was divided into three parts. Two extended behind the ears and down the sides of the face and the front of the body as far as the breasts. A third part went down the back as far as the shoulder blades. The enveloping wig was similar in size, but covered the ears and circled from one side, around the back, to the other side in one piece rather than three. The length of the braids varied to allow them to fall freely to the breasts at the front, to the shoulders at the sides, and down the back to the shoulder blades. The sun and heat required the Egyptians to pay considerable attention to their skin and their appearance for reasons of good health as much as vanity. Egyptians bathed frequently, some several times a day. Unguents and oils were applied to the skin by both sexes. One popular mixture was made of plant extracts mixed with the fat of a cat, crocodile and hippo. Eye makeup was regularly used to provide protection from the glare of the sun and from disease bearing insects. Red ocher was applied to the lips and cheeks for the same reason women use makeup today. Hair was a special problem. It was hot, hard to keep clean and easily infested with lice. Many solved the problem by shaving their heads and wearing a wig. The wig could be raised on small pads to allow a flow of air between the scalp and the hair and, of course, they never turned grey or bald. Women who kept their hair were told they could enhance its natural color by rubbing in a mixture of oil and the boiled blood of a black cat or bull. It was the fashion at parties for men and women to wear a perfumed cone on the tops of their heads. The cone was usually made of ox tallow and myrrh and as time passed melted and released a pleasant scent. Men and women socialized together. When it came time to eat they sat as couples at small tables piled high with food. The guests are wearing robes with vertical pleats. The servant girl (standing on the left) is wearing a thin belt on her hips, a brightly decorated collar and very little else; she does, however, have the scented cone on her head.